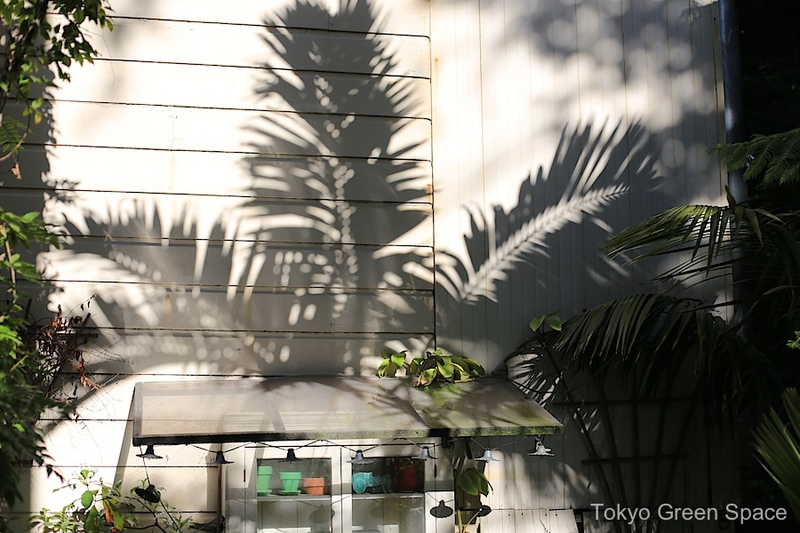 Few homes in Tokyo have lawns, let alone a row of tall exotic palms. If I’m not mistaken, these may be butia palms from South America. What a cool garden. Near Sangubashi. It’s hard to believe I planted this cold-hardy King palm in 2000 when it was half a meter tall. Now it’s the tallest tree in my San Francisco back garden. Below its reflection is the 100 year old, redwood “butler’s pantry” we removed from the apartment during the renovation. When I was there this fall, I up-lit the trunk. I love this path that starts at Shinjuku Dori, near the department stores, cuts between Kabukicho and Golden Gai, and ends up at the start of the male host zone in eastern Shinjuku. I wish all my city walking could be done on this narrow green path with mature trees. I love this hemp rope and lightening-bolt like paper decoration that makes visible the sacredness of the mature trees in the center of Meiji Jingu shrine. Approaching the shrine through a magnificent planned forest, visitors sense that this place has been set apart from a city that is in state of constant change. This tiny shrine in crowded Aoyama, next to the Comme des Garcons flagship store, is full of trees, including a mature pomegranate tree. I must remember to come back and try one of these fruits. Most unused land in Tokyo quickly becomes automated coin parking for automobiles. I like this empty lot with a mature tree, art work, and amazing collection of weeds. This long allée of cherry trees in Tatsumi, perhaps a kilometer-long straight path, is magnificent, especially at night. I suppose they planted the cherry trees at the same time the elevated freeways were constructed. All the trees in the park are reaching maturity now, probably 40 years later. Mature cherry trees cross Nakameguro river. Nearly full bloom. Nakameguro river is one of the best spots for viewing hanami. Last Friday was approximately 80%. Much family, student, friends, and co-worker public drinking and nature appreciation! Today it’s windy and raining, so perhaps the season is already over as the petals fall fast. 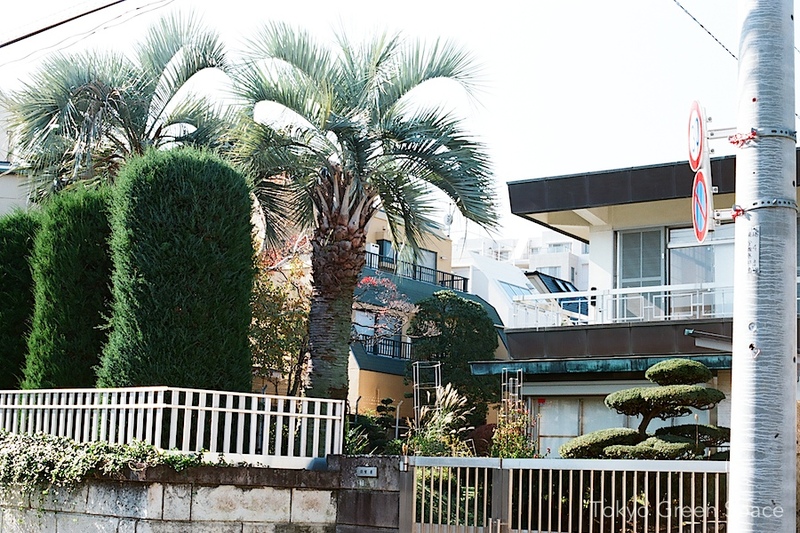 I love how this Nishi Azabu corner house has maybe 25 centimeters of space and a three-story tall garden of mature trees and bushes. The deciduous trees provide summer shade, and in winter the bare branches have a different appeal. 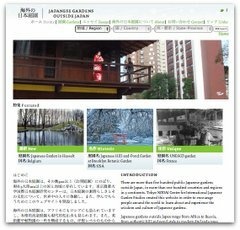 Why are there so few old trees in Tokyo? Many parts of Tokyo seem perversely devoid of tree canopy. That’s why I was thrilled to see this very public sign on a chestnut tree (shiinoki or シイノキ) in Shibuya ward. 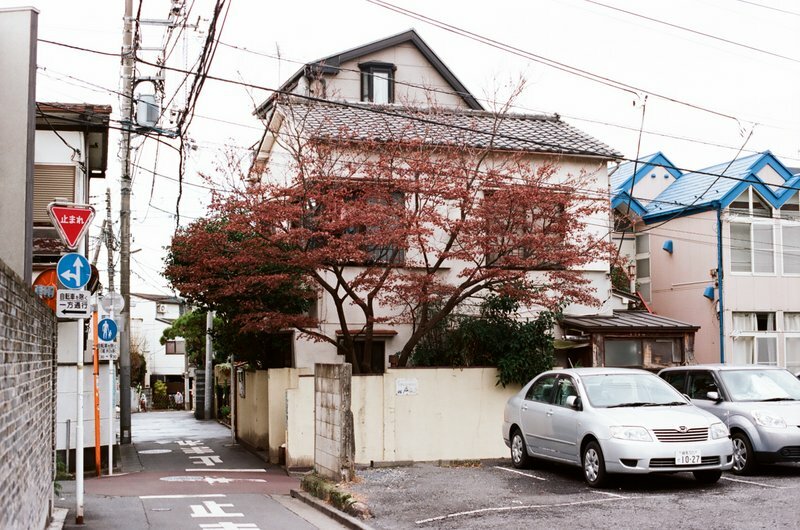 The tree sits at the back of the Naganuma School for Japanese study, in an area where large office buildings and residences are still being constructed. In almost every urban construction site, the prior landscape is scraped. I am not sure how much protection this sign offers the tree, but it’s good to know that the city is aware of the value of mature trees, and that passers-by will see the sign and wonder where the other trees went. Fall foliage in Tokyo is spectacular. I took these two images on a Sunday walk: the one above in Shinjuku Gyoen, the one below on the boulevard near Sendagaya JR station. I wish Tokyo had more mature trees. Walking at night in Chiyoda after a meeting at 3331 Arts Chiyoda, Chris and I found an amazingly dense and mature sidewalk garden that seems to be tended by a sushi restaurant. The planting is amazingly thick, creating a green wall between the sidewalk and the large boulevard in front of the restaurant. I like how the owners felt they could own this space and sacrifice some pedestrian space to make the small area around them so much nicer. There’s a variety of trees and bushes and small plants in recycled pots and layered on cinder blocks (called “breeze blocks” by the New Zealanders) and other found stuff including beer crates, wood, bricks, and blocks. There’s even two plastic pots hanging from a ginko street tree that are currently empty. Makes me want to contribute something!